Hi friends, Renee here from Fantastic First Grade Froggies. I hope you are having a wonderful start to your spring. We just finished our spring break and I am feeling quite refreshed. 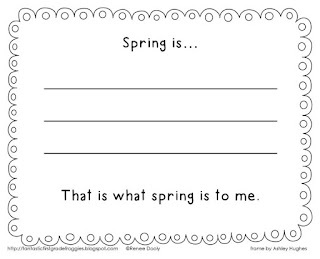 Now I am planning ahead for my spring activities that I will do in my class. I love this time of year! Here are some of my favorite spring books. Here is a freebie I had on my blog a couple of years ago. I do this every year and my kids love it!